Pump Alert provides alarms to extend the lifespan of a mud pump. Pump Alert catches mud pump failures before they become catastrophic. Pump Alert is a highly economical insurance policy. Pump Alert monitors the engine status, liner washer, prelube pressure, and the gear box status. Whenever one of these problems is detected an audiable alarm sounds, an external light on top of the building changes from green to red and an indicator light is displayed on the enclosure. The audiable alarm can be silenced with the push button on front of the enclosure. Silencing the alarm does not change the status of external green/red light. If a new alarm occurs when one is already silenced the audiable horn will sound again. In addition the Pump Alert monitors the engine run status to prevent warning audiable alarms when the engine is not running. The engine light on the Pump Alert enclosure lights up in parallel with the light on your engine. It indicates there is a problem with the engine. It is imperative that a rig hand checks out the problem to prevent damage to the engine. The liner washer status is observed by a flow switch. Monitors the pressure of the Prelube oil. As an option we can watch oil temperature. As an option, we can monitor gear box lube pressure. 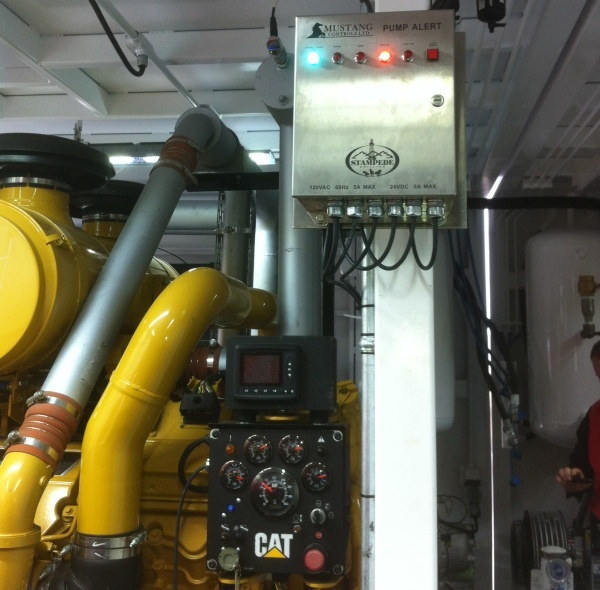 The gear box light on the Pump Alert enclosure monitors the temperature in the gear box. We can add any other monitors as you wish. We can also bring status lights to the rig floor as an option.